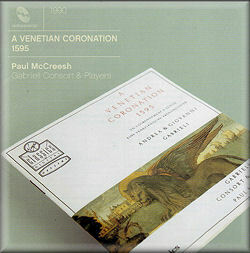 This is a reissue of the first of Paul McCreesh’s dramatically effective series of speculative ‘reconstructions’ of historical events: in this case the Coronation of Doge Marino Grimani in Venice in 1595. It was originally recorded in 1989, and deservedly won a Gramophone Award in 1990. Last year McCreesh revisited the same occasion, producing a new version for Signum Classics which was reviewed on this site by John Quinn, Johan van Veen and Mark Sealey (review, review, review). This newer version took advantage of advances in scholarship since 1989; but it is nonetheless a joy to welcome the Virgin issue - which has until only recently been available as a ‘special import’ - back to the catalogues. I have long treasured the original issue in my collection, and it is a delight to rediscover it.The reissue not only gives us McCreesh’s essay written in 1990 but a new note by Mark Audus which talks about the origins of the recording itself. We don’t get texts or translations – although this is pretty standard liturgical material – but it is a pleasure to be able to report that Virgin, unlike so many companies who are stingy with their booklets on even important reissues, still give us so much information about both the music and the recording. Well done. The recording sounds as sonically superb as ever. My fellow reviewers have all discussed in considerable detail the differences between this version and the ‘remake’ and, having not heard the latter, I would refer readers to those reviews. For those not familiar with the music, I will confine myself to pointing out the spectacular nature of the performances in particular of the brass music by Giovanni Gabrieli and the even more vibrant music by Cesare Bendinelli – the Sonata 333 with its drums is thrilling indeed, leading to Magnus Thomsen’s magnificent Toccata (omitted from the later ‘remake’). The movements from Andrea Gabrieli’s mass make a superlative centrepiece to this speculative reconstruction, which remains as great now as it did thirteen years ago. The closing Omnes gentes brings the disc to a resoundingly satisfactory conclusion. Among the singers one notes such subsequently famous names as Paul Agnew, Charles Daniels and Christopher Purves. I suppose that the most historically informed ‘remake’ must now be regarded as the primary recommendation for McCreesh’s version of this reconstruction; nevertheless this Virgin recording remains something very special.